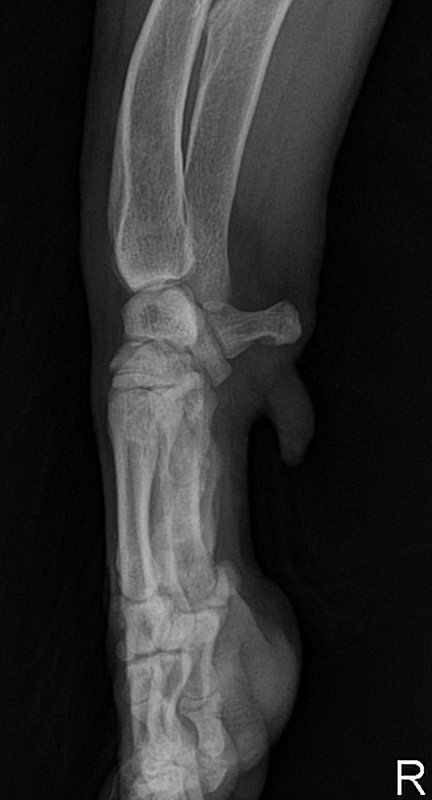 This is an older terrier presenting to you for left forelimb lameness. The key points here are the presence of a soft tissue mass, and the evidence of lysis in MULTIPLE bones adjacent to the mass. Why is this a mass and not swelling? Soft tissue swelling due to infection, hemorrhage, edema, lymphedema, etc. will tend to involve an entire region of the limb, there is usually not discrete margination. In this case I would describe the lesion as a mass, as there is no swelling in the carpus or on the lateral aspect of the limb. Lysis in a single bone points you towards neoplasia, but it could still be either a primary bone tumor or an invasive soft tissue tumor. Lysis in MULTIPLE bones is almost always an indication of an invasive soft tissue tumor. Osteosarcoma, chondrosarcoma, and other tumors of bone may expand outward from their bone of origin, and they may even cause a periosteal reaction or pressure necrosis in adjacent bones, but they don't typically cause lysis in adjacent bones. Could infection cause these findings? Yes, but it would be much less likely. Unless you are dealing with primary osteomyelitis, any osseous changes associated with soft tissue infection tend to be limited to a periosteal reaction, not destruction of the underlying cortical bone. So, to summarize… older dog, soft tissue mass, polyostotic osteolysis = invasive soft tissue tumor as your top differential diagnosis.